Having changed my mind over who to blog about first countless times over the last two days (actually weeks) the tossing and turning is over. In the end it had to combine my two favourite things: music and fashion. 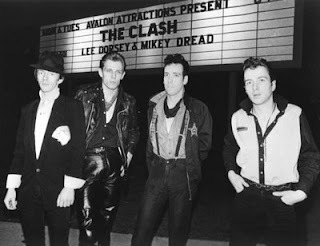 So let's start with the Clash. Bernie Rhodes (the manager) said "There's gonna be a lot of fighting in the streets. Things are going to get rough so we're going to need clothes which are tough." Rhodes approached a number of fashion students to realise his vision of tough streetwear that looked great on stage. Rhodes chose Alex Michon (pictured left in a Clash shirt) who at the time was a 19 year old art student. Her successive waves of militaristic designs have ultimately defined the look of one of the most visually exciting bands. We can also see the influence contemporary influence with brands such as April 77 exploring similar ideas. 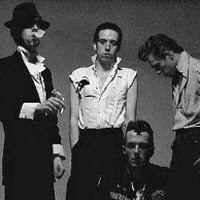 You would be misinformed to say that the Clash just wore what they were told to (never a good thing because you have to wear the clothes, not the other way around!). A key facet of their style was the individual inputs from the band members. 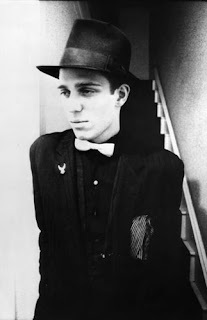 Simonon (pictured left, and looking awesome!) for example during the early days designed Pollock influenced paint splashes on the clothes and shoes. It is unlikely that I would do that a whole outfit but splattering your accessories, such as tie/pocketsquare/bag would look great. Another example is Joe Strummer adapting the zip jacket designed by Michon and worn at their famous Rainbow gig (April 1977) by stitching a ripped up photo from the Notting Hill carnival onto the side. (I have hunted for images to illustrate these two points but alas i am empty handed so please just imagine it, or better still send me what you find!). What we can take from these examples is; be creative. Look at the clothes you buy and wear, make them yours. Rather than just buying a new item of clothing look at what you already have, can you adapt an old piece that has been sitting in the wardrobe unworn and give it a new lease of life? Currently my to do list involves tapering trousers, adding zips to jumpers and pockets and of course this will all be blogged about no matter how successful or otherwise. Another part of their style mentality we like is the fact that the individual needs were taken into account for example Strummer had to have a little plectrum pocket inhis trousers and an inside pocket for the books that he always carried with him. At times too many people neglect their individual needs when thinking about the clothes they buy and wear. Granted, not everyone needs special pockets (even though they are cool) but thought about what we do in the clothes we wear has to have an influence on what we actually wear. 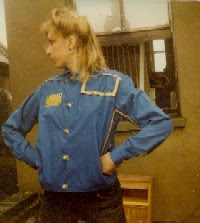 Overall when we think about what The Clash wore, we think of primary colours (with plenty of black), stencilled slogans/phrases and of course zips! I currently love black vintage leather biker jackets with a number of chunky zips but the hunt for one that fits as I want it to is proving hard. At the moment House of Holland-esque slogans (especially the typeface) are everywhere and to be honest I am a little tired of them but if witty and or interesting why not add one to an old t-shirt. We have only really touched on some of things we like, we don't want to bore you this early but it means we will return to this band! For us at Style Salvage clothes (although extremely important) are only one aspect of style. 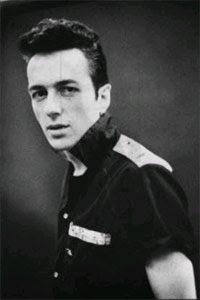 The Clash and in particular Joe Strummer provide ample material in discussions regarding how to style hair...but you will have to wait for that. Style Salvage has evolved from two friends talking/obsessing/analysing about the way guys dress around us, driven by one of our favourite past times: people watching. However, our addiction has also been satisfied by images captured within all forms of popular culture. We often accept how modern figures within pop culture influence us but we want to show how icons of the past can also play a role in how we dress. One of the key themes of this blog will be to take certain ideas from what we see and evolve them into something more personal. Having spent years practising the above in private we now have the motivation to share our insights, ramblings, grievances and celebrations with you. Why now? Well, we now live apart, one in Manchester whilst the other is in London...so to avoid huge phone bills we needed to find a cheaper avenue to air our musings and Style Salvage is it. Consequently rather than just two people going mad hopefully a few more of you can join in. We have been influenced by many of the fashion blogs out there but primarily by thesartorialist, who is everything we want to be when we grow up (yes we know we're probably meant to be grown ups by now). However, as a whole within this arena men's style is neglected but it will be neglected no more. Overall there will be two (at times very different) opinions on the style we see around us, yet we are always united in a shared good taste. With regards to men's style we believe that there are a few simple facets to remember and sadly a huge proportion of men neglect them or just don't know about them so this blog aims to explore and discuss them. This isn’t about laying into peoples’ clothing choices or focussing on the negative. This is about looking at what we admire and questioning that admiration: what is it that I like and how can I make that work for me? Surely no outfit is so bad that nothing can be salvaged from it? At its very worst, the complete unsalvageable will be a lesson in how not to dress yourself. Look at people around you: people you know, celebrities (alive and dead), look at photos of yourself. Even with the most dreadful outfits, you may be able to find something worth salvaging. It may look awful on them, but if you changed the shirt, pulled up the trousers - could it look good on you? Above all, we believe that it's important not to carbon copy someone else’s style. Always make it your own. Don’t be ‘that guy who dresses like so and so’; make it something different. Make people guess your influences. Keep it fresh and wear it well; look good but even more importantly look like you. Something else we hope to cover is vintage shopping for men. Given our love of past fashions and, of course, the particular style icons we will be talking about, men’s vintage is of special interest to us. This interest has been increased by our inability to (so far) find any decent, extensively stocked, well priced vintage shops for men. Certainly that is not to say we haven’t found some, but by and large the men’s sections are vastly inferior to the women’s, frequently just a rack of ill fitting suits in a dark corner. Hopefully over time we will be able to compile a directory of the best vintage shops. THIS WILL NOT BE LONDON-CENTRIC (largely because half of us live in Manchester). Any suggestions of your favourite menswear shops in your area will be welcomed and we will make an effort to check them out on our travels. We do not claim to be experts on… well, anything, including the styles and people we write about. This is largely our way of documenting any information we find and sharing our tastes and opinions with you. Hopefully one day it will be extensive and in the meantime we hope that it is interesting and useful. Feel free to email us with any comments and suggestions, or let us know if you think that we’ve made any mistakes. Be polite though or we’ll tell your mum.